I'm not one to go on and on about cocktails, but it's a good time of year for them and I've found one that I really like (probably because of both the taste and the lore around it). I read a few years ago that this cocktail had been invented at the Detroit Athletic Club during prohibition and had been rediscovered by a Seattle bartender (Murray Stenson at the Zig Zag Café) and was now becoming trendy on the coasts. Back then I wasn't spending any time on the coasts and the ingredients were difficult to get at the corner liquor store and none of the bars around here served it. 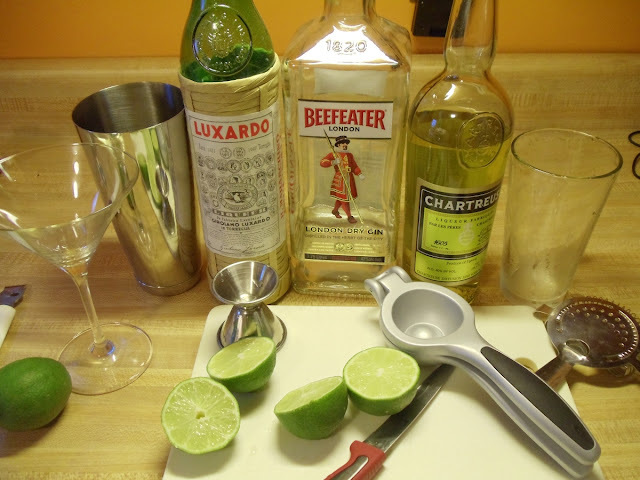 When we were at Roast for my wife's birthday a few months ago, our bartender was from Seattle and knew how to make the drink, which is a combination of equal parts lime juice, gin, maraschino liqueur and a rare herbal french liqueur called Chartreuse (the color is named after the ancient liqueur, not the other way around). 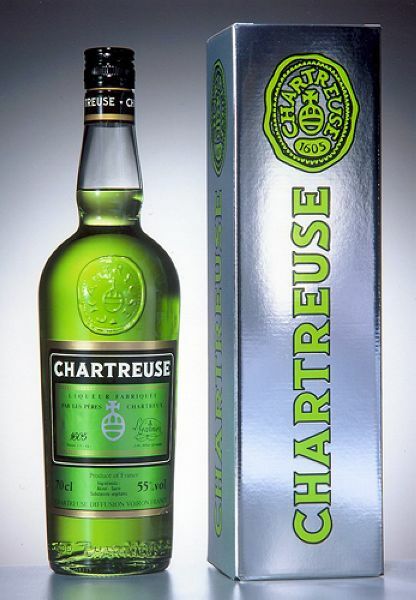 Chartreuse is probably the most difficult ingredient to obtain. It has been made from 130 herbal extracts since 1605 by monks of the Carthusian Order in Grenoble, France. According to the website, “Only two monks have been entrusted by the Order with the secret of producing the liqueurs. Only these two know the ingredients. 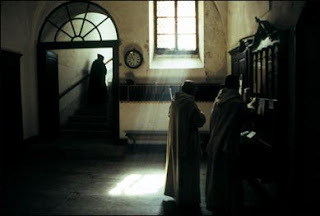 Only these two know how these ingredients are prepared for incorporation into the base of wine alcohol.” (The Carthusians are a serious lot, I wrote a bit about them way back in 2006). What's not to love about a liqueur that's an ancient secret kept by only two monks who've maintained a vow of silence? 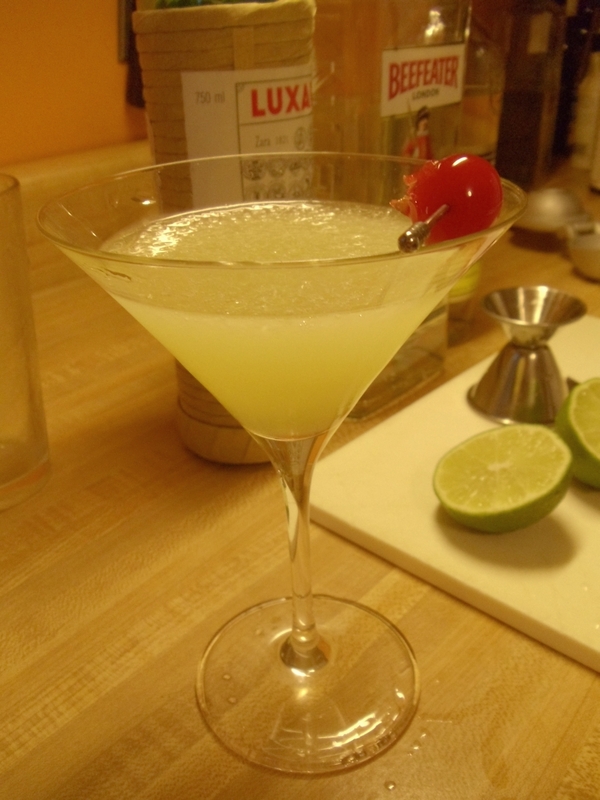 If you can track down a bottle of Chartreuse or a bar that has one, this drink is pretty great. It's sweet enough that my wife will drink it, and it has enough gin to make a man mean. I always prefer gin to vodka in my cocktails, and lately I've only been using Knickerbocker Gin or my sacred bottle of Junipero gin bottled by Anchor Steam out in San Francisco. They say these sweet aromatic liqueurs were used in the original cocktail to overwhelm the lousy bathtub gin, but I figure why use crap gin when you're shelling out big bucks for the other ingredients?